Approximately $1.2 million in grant funds from three divisions since 1993 has helped develop Pasquotank County’s solid waste and recycling program into a top-notch, comprehensive program. Pasquotank County provides solid waste and recycling services for nearly 50,000 residents who work in northeastern North Carolina and the Hampton Roads area of Virginia. Its comprehensive program serves a rural area and provides collection of bulk waste, yard waste, scrap metal, refrigerant and municipal solid waste as well as recycling collection and processing for a wide-variety of materials. The Division of Waste Management, since 2001, has provided nearly $888,000 for equipment to enhance the county’s program. Through the absolved White Goods program, nearly $429,000 over 16 years helped purchase a grapple truck and 12, 30-yard open-top roll-off dumpsters. A $30,200 grant from the Division of Waste Management’s Electronics Program helped Pasquotank County begin, develop and grow a recycling program dedicated to electronics collection. Two 16-foot enclosed trailers with signage bought with the funds are used for remote electronics pickup throughout the county as well as two stationary locations where county residents can come and drop electronics like televisions, computers, keyboards, printers and radios. 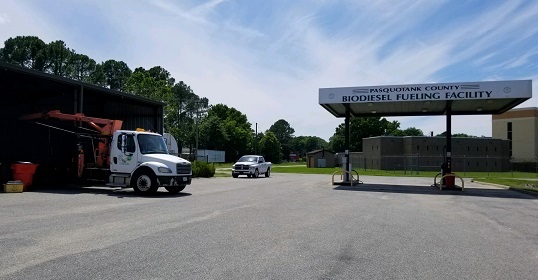 Using grants totaling $139,000 from the Division of Air Quality, the county purchased a 12,000-gallon aboveground storage tank, two-pump station and shelter that allows it to purchase diesel fuel at cost – saving the county thousands in fuel costs. Since 1993, the state’s Recycling Program in the DEACS has provided grants to Pasquotank County to develop and bolster awareness of its recycling program. Approximately $221,000 in grants kickstarted county’s recycling program, purchased equipment for program expansion, and created a permanent structure for the storage of construction and demolition materials. Most recently, DEACS awarded a $29,000 grant to purchase a compactor and three receiver containers to consolidate recyclables from its business recycling program. Another grant, totaling $20,000 with a county match of $32,000, will enable Pasquotank County to purchase a 48-foot walking floor trailer to transport recyclables. The state and the county are both pleased with the outcomes from the investments in county solid waste and recycling. “Working with the state’s recycling staff has provided a needed boost to get started and maintain the resiliency and stability of these challenging markets. The expertise and advice they provide has allowed us to expand and become more efficient with processing recyclables,” said Gardner.